Produce renewable fuels using a clean method that makes the use of cork and consume carbon dioxide was achieved by Robert Pullar, Rui Novais and Ana Caetano in the scope of the H2Cork project from CICECO/DEMaC of the University of Aveiro (UA), in partnership with a team from the National Laboratory of Energy and Geology (LNEG) and PROcédés, Matériaux et Énergie Solaire (PROMES) from France. With the objective of producing renewable fuels, more specifically hydrogen, a team of researchers created a material - cork-based ceramics - that was used as a catalyst for the separation of carbon dioxide using only concentrated sunlight. The ecoceramics have an alveolar structure that replicates the structure of the cork that serves as template. Cork is subjected to pyrolysis (i.e. decomposition through high temperature and absence of oxygen), forming a carbon structure that is subsequently infiltrated with a ceramic solution generating, after a thermal cycle, a ceramic catalyst of cerium oxide (CeO2). 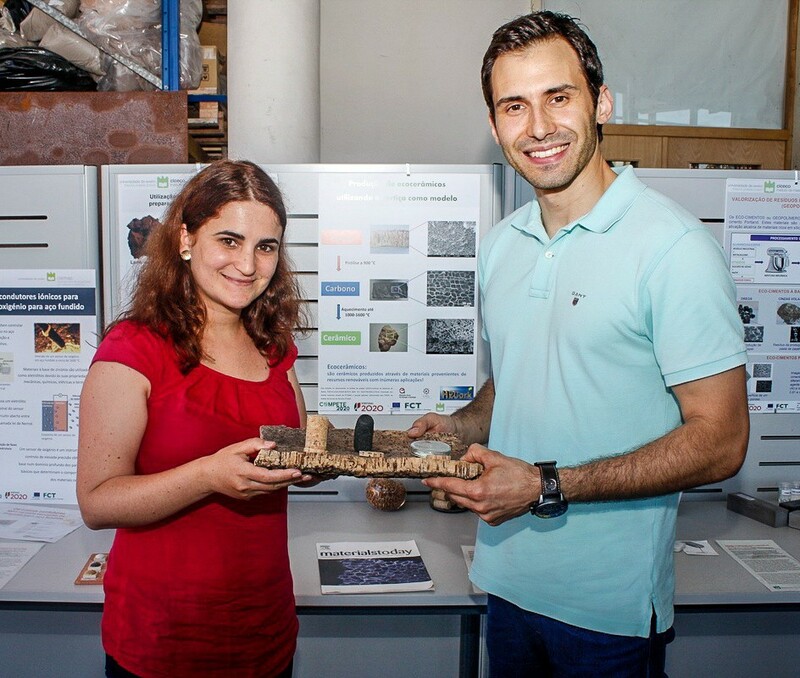 This extremely light and porous material can then be used as a catalyst for the production of renewable fuels through the action of the sun (which promotes the reduction of cerium at temperatures around 1400 ºC, only possible with special equipment available at PROMES). The subsequent oxidation of this material, which can be obtained by injecting CO2, allows the separation of CO2 into carbon monoxide and oxygen, which can be used in the production of renewable fuels. In the case of steam injection, this method allows hydrogen and oxygen to be obtained, with hydrogen being known to be a renewable fuel. The study for obtaining hydrogen is still underway, following the success obtained in the case of carbon dioxide already published in the Journal of of CO2 Utilization (June 2018 edition) - https://doi.org/10.1016/j.jcou.2018.06.015. Robert Pullar, the coordinator of the work, assures that the catalyst developed is twice as efficient in the separation of carbon dioxide as non-sustainable polymer substrates. Rui Novais, team member stresses the sustainability of the whole process: use of cork, a renewable and natural resource, to obtain a kind of mold, ecoceramics that act as a catalyst for the reaction, the renewable energy source (sun) and, finally, the production of a renewable fuel.